Franchisees Jess & Hannah open RUSH East Grinstead! 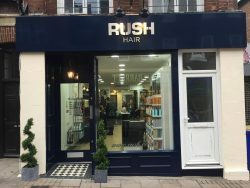 RUSH East Grinstead is now open! Hannah Sykes and Jess Quarmby, East Grinstead Franchisees were joined by Co-Founder, Stell Andrews and Operations Director, George Phouli. The Mayor was also in attendance and cut the ribbon on Saturday 29th October. The grand opening took place at 18 London Rd, RH19 1AG. There were lots of new clients waiting to take advantage of the 50% offer. Clients sipped on champagne and recieved RUSH goodie bags. The salon is located on the busy London Road, a short walk from the medieval high street. Near to the salon, you will find plenty of restaurants, pubs and bars. The amazing stylists are on hand to offer you beautiful hair at affordable prices. Whether you are looking to take advantage of our wonderful colour offer, have a simplistic cut, we will ensure you leave the salon with hair feeling revitalized.